Why Buy a Vintage Engagement Ring? When you're ready to buy an engagement ring, the sheer number of options can be overwhelming. What style is right? What kind of stone(s) should it have? How should the stone(s) be cut? What kind of metal should it be made from? Should it be ornate or simple? Those decisions rely mainly on your personal style and preferences, or those of your beloved. Once those questions are answered, it really comes down to one final choice. You'll have to weigh the pros and cons of new rings versus vintage engagement rings. This decision can also hinge on personal preference. But are there tangible advantages to buying a vintage ring? Absolutely. There may be a certain appeal to buying an engagement ring no one has worn before. It can feel more like it's truly yours, a part of you, and a symbol of your special love, and not anyone else's. But while no one else may have worn your particular ring, if you bought it from one of the more than 60,000 jewelry stores in the U.S., there's a high probability that at least one other person out there has your same ring. The same metal, the same stone, the same look, the same everything. Your love is unique, so shouldn't you have a unique ring? In the past, before mass production, and before jewelry chains grew presences in nearly every state, and even abroad, engagement rings were one-of-a-kind masterpieces. They were lovingly handcrafted by talented jewelers creating from their own imaginations rather than company-approved and widely distributed designs. They're miniature works of art, with no duplicates to be found. 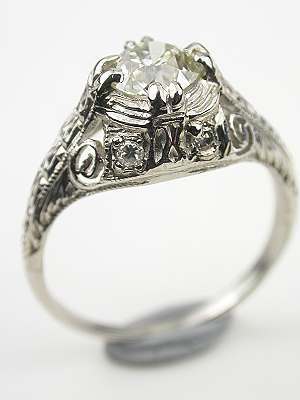 When you choose a vintage engagement ring, you can be sure no one else in the world will have the same one. Let's be honest here. You could walk into a chain jewelry store today, and buy an engagement ring for a few hundred dollars. There's no disputing that, and if you're on a budget, it may seem like the route to take. But before you do that, remember you're buying a piece of jewelry to represent your deep love and commitment, and that you'll wear for the rest of your life. You may even hand your engagement ring down to your daughter or son. When Prince William proposed to his now-wife, Kate Middleton, he did so with his mother's ring-the stunning sapphire and diamond engagement ring that belonged to Princess Diana-which itself is now one of the most-copied rings in the world. You may not be royalty, but if you spend a little more now on a vintage ring, you may just start a family tradition with a beautiful, stylish and unique engagement ring that will remain in your family for generations to come. This is less of a concern than it once was with new jewelry, now that fewer than 1% of the world's diamonds are the product of conflict. But what about all those diamond engagement rings for sale on auction websites, or on local sites such as Craigslist? Sure, those sites often provide good deals, if you're looking to save a little money. But how can you be sure the diamonds those rings contain weren't the result of slave labor or war? The last thing you want to do is tarnish your love by wearing a product of such strife. Because gemstones labeled conflict diamonds come from a specific period spanning from the early 1990s to the early 2000s, rings and other jewelry created prior to that time are conflict-free. They contain diamonds that were mined and produced without supporting war and human rights violations. And while fewer than 1% is an admirable number, it's still not zero. Yes, some diamonds that are produced today are still mined by captive workers, and are used to finance war efforts, or to buy weapons. This is one area where vintage has the clear advantage over new. A new ring can be beautiful, of course. But imagine wearing a vintage ring with a little history behind it. Imagine where that ring has been, who's worn it, what historical events it's seen. Imagine if that ring could talk, the stories it would tell! When you buy a vintage engagement ring, you're buying a tiny piece of history, of bygone days and strong-willed people who made their mark on this earth long before you. You'll be wearing something that has survived war, economic depression, changing styles, and ever-increasing human mobility. You'll be wearing history on your finger. And it's difficult to put any price on that. Shop our hand-selected collection of beautiful vintage engagement rings to find the one you'll love wearing until you hand it down to the next generation.